Recently i was pondering over all the different modelling accessories that were available out there, and how lucky we were as hobbyist to have such a wide variety of things to choose from. 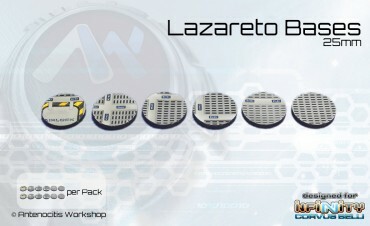 Bases, accessories, terrain, its all out there! For me the Internet has become my hobby Aladdin's cave! So i began thinking about what i use to supplement my hobby, and how i should share those experiences with the community at large. Its my civic duty really! So welcome readers to the first of my product review series! Not the most original posting topic I'll grant you, but product feedback really helps me choose items, so here's my two pennies worth! So without further ado, here is the first in my product review series! Many of the bases produced by antenocitis workshop bear the 'Designed for Infinity' stamp, so the aesthetic is bang on for the Infinity universe. That being said, their range is varied enough that i don't feel that they have backed themselves into an Infinity corner and made their bases unsuitable for any other game system. They model a wide range of terrain types such as dessert, ice/snow, forest, tech bases. The ONLY style i think they're missing is an urban style rubble base, which i think would really complete the set. 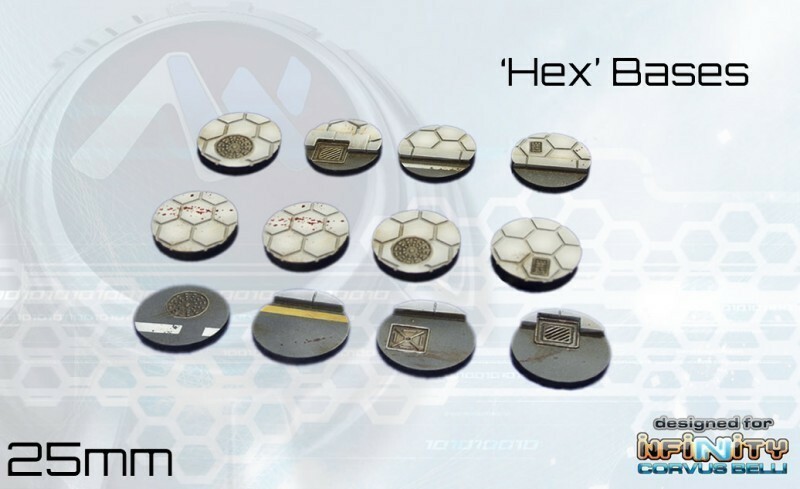 Lack of urban bases aside, the design of their various base styles is original and interesting, making them suitable for a wide variety of gaming systems. Sometimes with resin cast models and accessories, the quality can be a bit hit and miss. Some 'preparation' of resin is also expected to remove mould likes, flow gates, etc before use. So far i've found the quality of the casts to be crisp and clean, with only some minor preparation needed around the edges of the bases to remove excess resin. They don't seem to have that oily finish that some resin products have from the releasing agent, so that cuts down the preparation time. There has been no loss of detail in all in the bases i've sampled so far, ensuring i get exactly what it says on the tin! I have had blue and grey resin colours, but that hasn't changed any of the above to date. In my experience you usually get about 10 bases in a pack, but Antenocitis Workshop will offer you 12 for the competitive price of £7.50. The extra 2 bases is a big plus in my book, making your money go that little bit further. Their 40mm-70mm bases do range in price, but will be around the £5 mark for a large 70mm, and the same for a 2-4 pack of 40/55mm bases. This variability does affect the price point a bit for me, and most of the designs are flat. If they had a bit of height to them and some more features then i would be a bit happier paying more. A great product with a wide variety of designs to suit a multitude of game systems. Highly recommended! If you want to check out their website, you can find it HERE! I hope you've enjoyed the first in what i hope will be a long series of product reviews. If you are interested in having your product reviewed by A Guardsmans Guide to Glory, then please contact me on the email address on the right of this page.